Happy Easter to all of you who celebrate it. A happy beginning to all. When we wake up each day, it's like being born again. We have the chance to begin again. So, let go of all the stuff in the past that no longer serve you and begin to move forward toward your dreams. Start each day with gratitude for the opportunity to be the you that you've always wanted to be. Be grateful for the lessons of the past, have hope in the future and live firmly in the present. Try it! Starting new is not always comfortable. As they say, usually new beginnings are disguised as painful endings. For some, it's a break up of a relationship or being laid off from a job. For me, my biggest new beginning was the death of my daughter. My life changed so much but I'm not going to go into that now. Let's just say I wouldn't be sitting here talking about new beginnings, teaching yoga, and being a happy, fairly chilled (yes, this is a very chilled version of the old me) person that I am now if my daughter did not come into my life and left so early. The only way to start new after a painful ending is to be grateful for that ending. It's not easy but without being grateful, we can't start to see the lesson in it. Without learning, we can't really move on from it. If everything is always easy and comfy, there won't be lessons to learn and we won't be growing. If we didn't have that bitterly cold winter we just had, the sunshine and slightly warmer day today won't seem so special! Embrace the tough time, be grateful for all that you can learn from it, and then grow into a better future. Here is a link to a video of one of my teachers, Sadie Nardini, teaching us how to start our yoga practice without overdoing it and freaking out the muscles - Power Stretching Yoga Warm Up. I would suggest you do some Happy Breath and Happy Twist (see below for directions) to warm up before you follow Sadie's video. Let this be your new way of practicing on the mat. Warm up sufficiently, then stretch gently as you continue to build heat before you launch into stronger, deeper poses. 1. Stand with your feet about hip width apart, knees soft. 2. Inhale and stretch your arms forward, open to the sides and then raise up. All 3 movements in one smooth long breath in. Exhale with HA sound, bend the knees and drop your torso and arms down into easy forward bend. 3. Round the spine to come up as you breathe in and repeat the 3 arm movements. Exhale with HA and drop into easy rag doll-like forward bend again. Repeat at least 6-8 times. Make sure you really let the HA out loud! 4. These movements are done quite quickly so that you begin to warm up the body! Make sure you keep the pelvic floor and lower belly engaged (drawn in and up to protect the spine). 5. Stay in the last forward bend with soft knees and wave side to side or bend one knee and straighten the other to stretch the body out a bit. Slowly come back up with rounded back, head up last, when ready. Now you're ready for the Happy Twist. 1. Stand with feet about hip width apart again. Let your arms hang loosely by your sides and keep the knees slightly bent. Engage the pelvic floor and the lower belly. 2. Breathe normally (soft ujjayi which is like when you blow to fog up a window but through the nose) and begin to gently twist side to side. Allow the arms and the head to move with your body. 3. Speed it up when you're ready and keep going for a while until you feel nice and warm. The spine will love it (as long as you don't overdo it!!). 4. Please don't just suddenly stop. Gently slow down. Just like the blades of a fan that spin a bit slower, then a bit slower still until they stop spinning. You might want to add a few cat-cows (on hands and knees, inhale to open the heart in a gentle backbend, and exhale to round the spine, tucking the tailbone and the chin in). You're now ready to begin this wonderful 37 minutes Power Stretching Yoga Warm UP with Sadie. Be well, everyone, be wildly happy and grateful for each new day, each new breath, and be the kindest and best you always. Have a fabulous April. Wow, it's hard to believe that we are already in March! So sorry I haven't posted a blog in a while. Here I am though! I hope you're all enjoying the slightly warmer and definitely longer days. FInally, the short, dark, and seriously cold days seem to be behind us. Having said that, I'm glad for those days when the temperature struggled to get above 0 degree because suddenly 6 degrees seem warm! It also brings home to me the idea of unity within duality. What is unity within duality? You might think that yoga is all about unity, and you'd be right but unity cannot exist without duality. Oneness would mean nothing if there was no duality. In our physical practice, we always talk about rooting down and rising up, drawing in and reaching out, surrender and effort, and so many other seemingly opposing actions or concepts. It's these opposite actions that bring us back to our centre, to the stillness within. When we practice a pose and focus our attention on the opposite actions taking place within the body, we are also creating unity in another kind of duality - unity of the mind and the body - which leads us right back to our calm centre. Let's look at a simple pose like a low lunge. In Low Lunge, the feet, the back knee and the tailbone are rooting down into the earth while the crown of the head and the arms reach up. The 2 halves of our pelvis also move in opposite directions: the front half in a posterior tilt or at least squared, and the back half in an anterior tilt (nodding forward). In fact, even when we walk, the 2 halves of our pelvis move in opposite directions! Our spine meets our pelvis at the SI joints so you can imagine that as the 2 halves do their thing, the lower back spine can be affected. If we can engage our core muscles, we can keep the spine from being pulled and torqued along with the hips. So the two movements of our hips lead us back to our centre, our core. In life off the mat, duality bring us back to our centre too. When our reality is different from our goal, we need to come back to our centre, our core belief, in order to live and express ourselves in a way that serves us best. If we live only in our dreams of the future, we aren't grounded in reality. If we focus only on our much we hate where we are, we can't move forward to our desired goal. Yes, have a dream but live in the now. Yes, accept your reality but never stop dreaming. Join me this month on the 24th, 10-1:00 at Escape Yoga Studio, Matlock, for our Unity in Duality workshop where we will learn to move our body in opposite directions in order to move into stillness, and learn how you can take that off the mat into your life. Please see Unity in Duality Workshop for more details and for information on early bird discount. Please contact me to book your place. There are always the sun and the moon, the day and the night, the light and the dark. Embrace them and you will find peace right at the centre. Be well, yogis, be wildly grateful for all that you are and are not, and be the best and kindest you always. The world didn't end! There's a surprise. I did wonder for a moment yesterday "what if it did", and my answer to myself was definitely "No regrets"! It's not that I've been such a good girl and made no mistakes. It's just that I've chosen to forgive myself for the mistakes and to learn from them. I have lived every day like it was the last. I choose to be me and to live my truth with as much kindness and compassion as I can. I mess up occasionally, but hey, I'm not perfect! One thing I have learned recently is that I was starting to get confused about balance and symmetry! Balance is really one thing I strive to achieve in life but I think I was making excuses and ending up going towards symmetry! What's the difference? Well, symmetry is when 2 sides are exactly equal and mirror image each other. Nothing in nature is symmetrical. Nature does not seek symmetry but balance. Balance seems to imply that 2 sides do not mirror image each other but they complement each other. They exist in harmony with each other. I've always said that you need to create balance, harmony, in your life between work and play, exercise and rest, and healthy eating and pigging out on rubbish. While I don't regret the playing I did in 2012, I believe I may have played too hard! You might have heard of the 80-20 theory whereby you exercise and eat well 80% of the time, and then allow yourself to indulge in chocolate or ice-cream (or a bit of champagne!) the other 20% of the time. I was working on eating well, exercising and working hard 6 days a week, and eating rubbish, partying, staying up late for one day a week. That would have been fine if I'd had a roast dinner followed by a sticky toffee pudding, a bottle of wine and going to bed by latest 2 a.m on my one naughty day a week. It's not ok to start the day with Pain Au Chocolate, big meal with pudding at lunch, a small jar of Nutella for snack, Indian curry plus more pudding for dinner, 11 cocktails later and in bed at 5 a.m.! That's just so not ok. While I didn't do that every week, I was doing enough of it for me to realise that soon this day-off is going to kill me! Trust me, while I would have no regrets if the world had ended, I'd rather not die this soon! While I have no regrets, I'd be a fool if I didn't learn from my mistakes. My intention at the beginning of the year was to be more centred, more balanced, and to be more self-aware. In many ways, I was more aware and centred because, if not, i would not know how off-balance I was in the way that I was living! My intention for 2013 then is to look after my health better so that I can be at my best to care for my family, and to practice what I preach so that you will believe me when I say balance is what we need in life and you are the master of your habits! Having no regrets involves self-forgiveness but don't let that be an excuse to not learn from your mistakes. Instead, learn, forgive and live by this quote by Maya Angelou, "Do the best you can until you know better. Then when you know better, do better". Gratitude is also the key to contentment. I'm so grateful for my good health (which I intend to keep! ), for my husband, who allows me to be me, and for my very funny, clever and loving son. I'm grateful that I've had the opportunity to catch up with so many good friends, meet so many new people, and teach so many brilliant yogis. I'm grateful for the money to buy food (even the chocolate and the champagne :-) ), and the time to go and enjoy myself. I'm also grateful for quiet moments, the me-time, to reflect on my life, to practice my yoga and karate, and to miss my daughter (who passed away when she was nearly 4 months old) without falling to pieces. In particular, I am grateful that, instead of becoming hard and bitter after the death of my daughter, I found softness in my heart. This heart of mine goes out to all who have lost their loved ones, especially the parents of the little ones who were senselessly murdered in Connecticut. I know they are hurting so much right now. I just want to say to anyone who has recently lost, grief is something you cannot get over but must go through. Allow yourself to feel whatever comes up without beating yourself up. Although time does not heal the way people seem to think it does, over time, you will learn to cope with the hurt and to see that it's ok to feel the hurt and still see the joy in life. It is fine to cry over your loved one and still have happy moments. It's not wrong to be ok for a moment, a day or even more. It's our nature to be happy. Our soul, our true self, is happy and the happiness wants to come through. Your loved one knows this truth too. So don't harden your heart. Don't build walls. Keep living, keep loving, keep trusting. It's not easy at first but it can be done. I know this because I've done it and I'm still here, soft, tender but still open to the love, beauty and joy. Enjoy the festive season. Be well, be wild, and always be the best you. Merry Christmas, Happy Hanukkah, Happy New Year, Swadee Pi Mai, best wishes. The sun is out. Ok, kind of, but once the fog has cleared, it'll be lovely. We must always have hope! Speaking of hope, there is one man right now who is inspiring hope and faith in so many people - Alex Zanardi. Unless you're a motorsports fan or have been watching Paralympics hand cycling race, you're probably thinking "WHO"? Alex Zanardi started kart racing when he was 13 before he eventually made his way up to Formula One. After a few years in Formula One, he moved to the US and switched to CART, which is like America's equivalent to F1. He was doing particularly well on this one fateful day before losing control of his car and was hit at full speed by another car. He lost both legs in the crash. Three months later he was up walking (on prosthetic legs), and two years later he completed the last 13 laps of the race that he didn't finish because the accident. He gave up motorsports eventually to train in handcycling race for Paralympics 2012. He won GOLD. Here's an article on his win: Alex Zanardi Wins Gold in 2012 Handcycling Race. If you've read it, did you notice what he said? "I have been lucky as usual"! How utterly amazing is that? He nearly died. His legs were decimated in the crash. As one of his doctors said, "His legs are gone", as in the crash took his legs off him! His heart stopped SEVEN times. He's never complained, and never had any thoughts that he was somehow less without his legs. He immediately started working out how to go about doing the things he loved: being a dad, a husband, a racer! If he'd despaired and given up, it'd be easy to understand. Instead he chose to be grateful for being alive. My race is now at the prosthesis center of Budrio, the challenge is to make a pair of legs work. They do not have blood, but they hurt a lot, they are cold like metal, but they make me sweat as if I am always climbing, they allow me to move forward but they make me fall. That's why people value my tenacity. The press follows my story and the same do media. A well-known person like me becomes now famous because of, or thanks to, what he was subjected to and to those very same prosthesis that, after lots of stifled painful tears, give him back the life and satisfactions. I return to my travels, to everyday things and, even without knowing it, I move close again to my own world. I am so in awe of this man. It is this gratitude, this willingness to focus on the positive, that opened him up to possibilities. Gratitude creates space to allow more positive to flow in. When we focus on all that is wrong, we fill our lives with negative energy. Where then is there room for the wonderful things we want to flow in? However hard things get, there is always room for gratitude. When things are not as we want them to be, be grateful for the strength that you have to cope with the situation. Reflect, learn and be grateful for the lesson. You can even be grateful when someone is nasty to you because you now know how not to treat others. See, everyone and every situation is a teacher when you choose to learn. If you want to know more about Alex Zanardi and to be inspired by his courage, his positive outlook, his awesome ability to accept reality and be grateful, have a look at these two clips that I posted at the bottom of this blog (click on the buttons). Speaking of which, can I just say I'm so grateful to all of you who have liked my Facebook page. I can't believe we've got 108 likes already. Please do drop by and leave a comment on FB or on here. If there is a pose you'd like to learn or if you would like me to film a short video showing poses or sequences that target certain parts of the anatomy, please do let me know too. In the meantime, I'll just keep posting poses that I find helpful for me and my body right now! Today, it's the Puppy Pose. Click on the button below for your step-by-step guide to this wonderful shoulder stretch. If you sit at a desk all day long or cycle for hours or lift heavy weights (like a child or a dog! ), you will love this. For more shoulder-freeing, and also hip-opening yoga, please join my workshop on September 30, 10-1:00 (or 12:00 if you want a shorter session). See workshop for more details and contact me to book a place. Right, it's time to go out and enjoy the sunshine, for which I cannot possibly be any more grateful! See you in class (see Group Classes or Private Classes for details) or at the workshop or, better yet, both! Have a happy September. Can you believe it's nearly Autumn? Where was summer? I hope that you managed to get out and about to soak up whatever bit of sunshine we had. I certainly made the most out of every sunny day going out for long walks with my little guy. On the wet days though, I stayed in and worked on getting this new website up and running. I hope you like it. Please do leave me a comment and let me know what you think. Thank you. Apart from a new website, something else new came into my life - a new puppy. Shadow. We adopted her from a rescue home in Derby 3 weeks ago. She's a beautiful Doberman cross (with what, we don't know). This dog is so full of energy. She is also very nervous. She's warmed to us but not to our friends just yet, and certainly not to crowd and cars! We can't leave her for a long time on her own because she gets distressed and starts chewing our back door! We are giving her lots of cuddles and loving. We are also slowly introducing her to our friends, one or two at a time. Step by step, we are showing her that the world is not such a bad place and that we are not going to abandoned her. I have no doubt that with our love she will learn to adjust and trust. That brings me to our latest Free Yoga: The Crow Pose. Like my pup, we all have fears. For many new and even more experienced yogis, the Crow pose is scary. It takes time to tone up the core and the upper body as well as to open the hips. With practice, though, you will eventually learn to trust in your strength and your balance. Keep practising. Our next workshop is very much about opening the hips and freeing the shoulders. You can't just keep weight bearing on the shoulders without stretching out the muscles. Although it's a 3-hour workshop, you can opt to stay for the first 2 hours. See Workshop for more details and contact me to book your place. I will be adding new yoga tips and videos as regularly as possible. Please do come back and have a look. Enjoy the rest of summer (hmmm...). It's my birthday in a few days so I'm going to be celebrating a bit. Pop into Maazi on Tuesday night and have a drink with me! 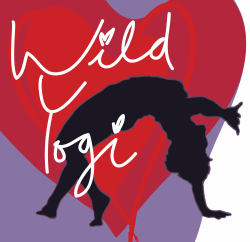 Wild Yogi Wendy - I'm a full-time mum and wife. I teach different styles of yoga. I'm learning Karate. I love chocolate and champagne!